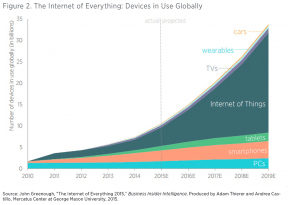 This article aims to answer the question, “Why IoT is important?”, from a different perspective. Every period has been the major revolutions and innovations in the field of industry. These revolutions occur with a power of new phenomena like the invention of steam engine, computers, and the internet. IoT which is the new phenomenon like these places the heart of “Industry 4.0”. Let’s return to our question again, “Why IoT is important?” It is necessary to talk about Industrial Revolutions in order to understand the answer to this question. The first Industrial Revolution, the Industry 1.0, that started in the 1760s and lasted into 1830s, the production evolved from physical strength to machine power. Increasing in quantity and improving in quality, the machines used steam power. After production was mechanized during the First Industrial Revolution, the “Second Industrial Revolution” was triggered, along with the development of technology. Industry 2.0 has called technological revolution. This period between 1840 and 1870 is also known as technological Revolution. Industry 2.0 was all about the Mass Production first powered by electricity, then kept moving by oil. This new technology superior to steam power ensured that the machines are further advanced and the production increased greatly. With the mass production, iron and steel raw materials have become widespread and allowed the heavy industry to develop. The term “automation” was first used in the middle of Industry 2.0. Delmar Harder, Ford’s vice president of production, first described what we described as factory automation in 1947. During the first half of the 20th century, two Big World Wars had started one after the other and country borders had been shattered. Negative economic developments such as the Global Crisis in 1929 slowed the pace of industrialization of all countries. After the effects of the World Wars, beginning in the late 1960s, Industry 3.0 started to support electrical mechanization with the power of computers. The computers that mentioned, are called the Programmable Logic Controllers (PLCs). These controllers can automate a specific process, machine function, or even an entire production line. Another important progress during the Third Industrial Revolution was the development of communication technologies along with the supercomputer. The most important innovation that has influenced the development of technology was the discovery of the internet… It has changed everything. The internet connected PLCs, computers, sensors, robots, mainframes, and people all over the world enabled businesses to do things even more intelligently and efficiently. These innovations were showing that defines the next frontier, Industry 4.0. In the Fourth Industrial Revolution, the machines began to manage themselves and the production process, so they no longer needed manpower. 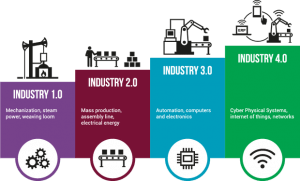 To understand Industry 4.0, we need to look at what the industry 4.0 needs and what factors will evolve as a result. While the industry is evolving, needs of industry increase. Each revolution creates new needs. For instance, there was a need for basic materials at 1.0, human needs at 2.0 and automation at 3.0 can be said to be necessary. So, What are the needs of the Industry 4.0? In the Fourth Industrial Revolution, the machines begin to manage themselves and the production process, so they no longer need manpower. In the future, technology will go where people use dark factories. Dark Factories will not need people. This advanced technology, called the ‘Internet of Things’ (IoT) will allow a production factory to manage itself virtually. Dark factories, in other words, factories where lights out, are equipped with fully automated systems and are structures that do not require the presence of any human beings in the world. Many of today’s factories have dark factory features, but the work of the workers in places where typical human power is required, such as removing parts, is a necessity. Production in dark factories provides 24 hours of performance even under a number of different conditions, resulting in an increased productivity curve in the production process. Today, manpower is still used in manufacturing methods, but when you look at the operation of the machines, it is observed that much more efficiency is achieved with dark production.